3W COB LED technology with 300LM of max output, and have a LED in top for flashlight. A magnetic base and 180&apos; magnetic rotating COB makes it easy to mount your light where you need it for hands-free operation and convenience. Built-in rechargeable lithium battery, wth USB powered charging cable up to 2-3 hours runtime. Designed with ABS body that is water-resistant and impact-resistant. 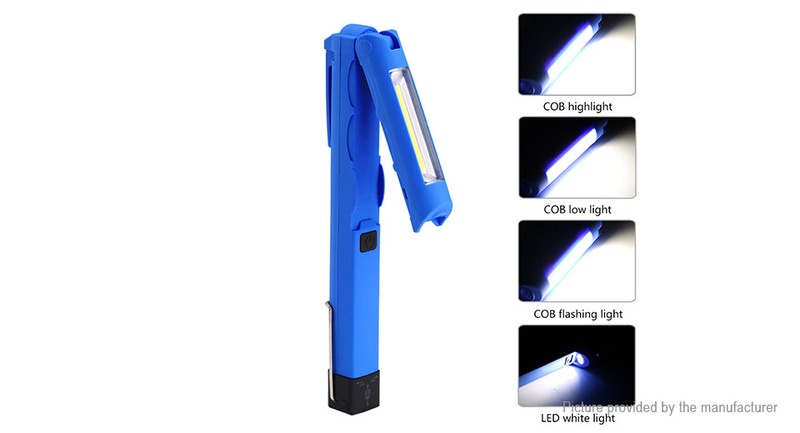 The light has 4 modes: COB Strong, COB Weak, COB Flash, and LED Strong. Perfect for home, workshop, camping, hiking, hunting, fishing, walking, automobile repairs, roadside emergencies and so on; provide great convenience to your life.